President Donald Trump called for unity and coalition building in his State of the Union address Tuesday night and sought a path forward for congressional negotiators to make a deal on border security funding to avoid another government shutdown. Trump backed away from his former demands for a concrete wall and called for a “smart, strategic, see-through barrier,” signaling he may accept a form of border fencing that Democratic lawmakers have also said they may support. A bipartisan group of lawmakers has been scrambling to negotiate a border security funding deal by Feb. 15 to avoid another lapse in federal funding. After weeks of federal workers missing paychecks, delays at airports, and abandoned national parks, lawmakers are trying to write a compromise package. The record-setting 35-day shutdown spurred by Trump’s call for a border wall ended Jan. 25. Democrats said Trump focused too heavily on barriers instead of other, more cost-effective border technologies, such as drones, sensors and surveillance. Trump has shifted his stances before and spent weeks calling lawmaker negotiations a “waste of time.” Negotiators have said they hope to have a package ready by Friday for a vote next week. Senate Homeland Security Appropriations Chairwoman, Shelley Moore Capito (R-W.Va.) said she was encouraged by Trump’s hands-off approach to the negotiations. In his speech, Trump painted border and immigration issues in a moral light, setting himself up as a foil to House Speaker Nancy Pelosi’s (D-Calif.) statements that walls are immoral. The president called on lawmakers to fund a barrier to stop human trafficking and the flow of narcotics. It is the government’s job to protect working-class jobs for U.S. citizens, he said. “Now is the time for the Congress to show the world that America is committed to ending illegal immigration and putting the ruthless coyotes, cartels, drug dealers, and human traffickers out of business,” Trump said. Republican support for fully funding Trump’s border wall has been tepid. The initiative wasn’t passed even when the party controlled both chambers of Congress over the past two years. Last week Democrats laid out their own plan to fund the Homeland Security Department before the Feb. 15 deadline. The summary included hundreds of millions of dollars to boost technology at the border, hire 1,000 more customs officers, and effectively reverse a Trump administration policy that limits victims of domestic and gang violence from receiving asylum, but included no funds for a wall or fencing. House Speaker Nancy Pelosi (D-Calif.) and other Democrats have said, however, they are open to fencing. Trump has gone back and forth multiple times about his demands for the total length of the wall and if it needs to be made of solid concrete or fencing-like models with steel slats. Trump and Senate Republicans in January laid out a plan to fund DHS at $70 billion in discretionary money, up from the Democrats’ proposal of $56 billion. The GOP’s plan included $5.7 billion for a border wall, as well as funds for 750 new border agents and 375 new customs officers. About 650 miles of border barrier have already been built along the Southwest border with Mexico since the 1990s. The border spans almost 2,000 miles. 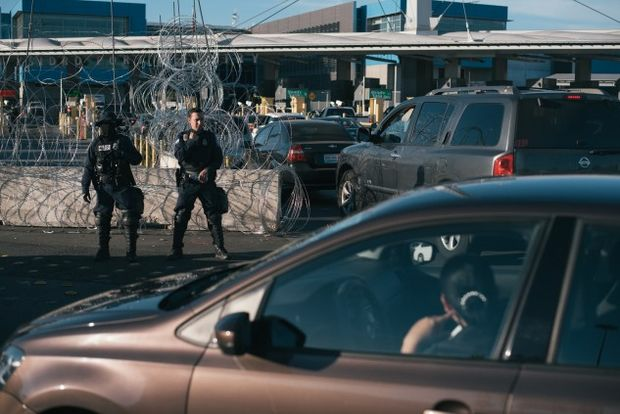 U.S. Customs and Border Protection Commissioner Kevin McAleenan told the Senate Judiciary Committee last fall that about 1,100 miles of barrier are needed to secure the border, as the remainder falls in mountainous or desert areas. McAleenan said the cost to build one mile of fence ranges from $5 million to $25 million, depending in part on the terrain. In fiscal 2017, Congress appropriated approximately $300 million in funding to replace about 40 miles of barrier, which is nearly complete, border officials told reporters in January. In fiscal 2018, Congress set aside roughly another $1.4 billion to construct new and replacement barriers. The new barrier, along about 30 miles in the Rio Grande Valley, is slated to begin construction this month, a CBP spokesman said in an interview.